Minutes after a smooth launch of its Dragon spacecraft this afternoon, SpaceX hit a long-standing, elusive goal: It neatly landed the Falcon 9 rocket that had launched the Dragon right down on a drone ship like it was no big deal. 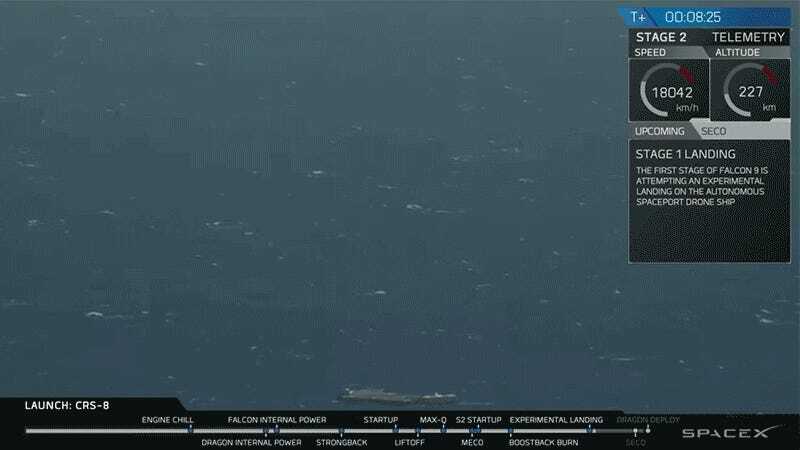 SpaceX has been sending Falcon 9s to land on the ocean barge—named “Of Course I Still Love You”—for months now. The private space company had already successfully made a landing on solid ground, but that’s so boring. Why not try something new and seemingly impossible? Well until today’s successful landing, every rocket that SpaceX sent plummeting towards the drone ship either tipped, exploded, or just narrowly missed making the landing. The last Falcon 9 came tantalizingly close to sticking the landing in March, but at the last second came in just slightly too fast. Before today’s landing, SpaceX remained cautiously optimistic about the chances of making it this time. Founder Elon Musk even said there was a “good chance” the Falcon 9 would make it, but SpaceX continued to hedge about the possibility. Now that SpaceX has succeeded in landing a rocket on a drone ship, however, the implications for how we launch and land spacecraft will be huge. Rockets are suddenly significantly easier to reuse for multiple missions. With this landing, the possibilities of where to land have also become almost limitless. Of course, before a dependable floating landing pad is a real reality, we’ll have to see quite a few more drone barge landings. SpaceX engineers also dropped a bit of a note of caution moments after the Falcon 9 touched down, noting that it still had to check and make sure the rocket was fully operational before it could declare complete success. How could you not feel great about that?